If you associate Aboriginal art with dot paintings you limit yourself. Beyond the dots is a universe of art as diverse as its artists. You only need to walk into a souvenir shop to find that Aboriginal art seems to equal any object painted with dots. But nothing could be further from the truth. The dot style only emerged in the early 1970s from the remote Northern Territory community of Papunya. It's a tiny fraction of the art styles and media available to contemporary Aboriginal artists. Dance. Today dance can be traditional, contemporary or both. Audiences around the world love the world-class Bangarra Dance Theatre or the Northern Territory Chooky Dancers' interpretation of Zorba the Greek. Visual arts and craft. These include pottery, textile-based art, weaving, jewellery, ceramics, wood carving, miniature carvings, grass weaving (tjanpi), shell stringing (see below), glass work and Aboriginal films. New media artists work ghost nets into artworks, paint skateboards or create dilly bags from scrap metal. Theatre. There are several Aboriginal theatres, some operated as early as the 1970s. Language. Art around language includes Aboriginal music and storytelling. Lore. Lore is the 'body of knowledge' passed on through storytelling in its various forms. Photography. Several Aboriginal photographers have made a career in the professional market. Ceremony. Artists perform both traditional and contemporary ceremonies, and not only for tourists (see Welcome to Country). Visual arts and crafts are the most popular Aboriginal art forms, followed by dance and then theatre . Storytelling is at the core of Aboriginal art in all its manifestations. Whether it's visual art, dance or film, "storytelling is the mother of all those mediums", says Stephen Page, artistic director of the Bangarra Dance Theatre . "It's a huge part of our cultural fabric. There is a great confidence and pride about black practitioners telling their stories in whatever medium." "The thing that sets Aboriginal art apart is the story," says Gurindji artist Sarrita King . "I don't think that the story will ever leave Aboriginal art. When you walk into an Aboriginal art gallery, it's like you're walking into a book. You're walking into knowledge, into a beautiful picture book where every image you see has a soul." Seith Fourmile, from the Djumbunji Press in Cairns (Queensland), explains that development on land does not affect its stories. "When we talk about story, just remember that even though buildings might sit on country, our country is still the same underneath and those stories are still the same." "They'll never die, they've been there a long time and they'll still be there when we pass on. The thing is trying to keep that tradition going and that culture and stories strong." But Aboriginal art does not stop with cultural practices. Contemporary, young Aboriginal artists take it into the new millennium and become Aboriginal new media artists. Karen Casey is such an Indigenous new media artist. Descended from the Pydairrerme people of the Tasman Peninsula, she created Art of Mind in 2004. A computer program lets the audience see the artist's brain activity. "In Art of Mind, I focus on my inner connection with the land and with others and on promoting reconciliation and people coming together. People genuinely want to make a connection, to be on the same 'wavelength' and this is what we explore," says Karen . The didgeridoo is known by more than 200 names. Yidaki is the first and oldest name whose origin is Arnhem Land in the Northern Territory. 'Didgeridoo' is the name white people gave the instrument after hearing its sound. The Tjanpi Desert Weavers are among the recent success stories of the Aboriginal art industry . The Ngaanyatjarra Pitjantjatjara Yankunytjatjara Women's Council (NPYWC) founded the collective in 1995. More than 300 Aboriginal women from 28 remote communities in the western and central deserts of Australia come together to create their art, work, sing and swap stories. The process has encouraged these artists to make large, ambitious sculptures. Their best-known piece is probably the Tjanpi Grass Toyota, which won the 2005 Telstra National Aboriginal and Torres Strait Islander Art Award. In September 2011 the sale of a tjuringa at an auction house in Britain made headlines in Australia. Tjuringa is a term generally meaning 'sacred object' and 'sacred practice' . It was used by the Central Australian Arrernte people as a prefix when speaking about many sacred items, including headdresses, poles, bullroarers, earth mounds, ground paintings and incised stones and wooden boards. They also used it in reference to traditions, rituals, ceremonies, songs and stories. In its broad sense tjuringa (also spelled 'churinga') is mostly used for sacred incised and/or painted boards or stones many Aboriginal groups (not only the Arrernte) have made. Tjuringas may be used in rituals to represent ancestral beings or protect the carrier from harm. Others are deeply personal objects symbolising the essence of the owner's individual spiritual being. If the owner dies their family stores the tjuringa in a safe place. Death was the punishment if someone broke a tjuringa, or let unauthorised people (for example women) see one . Only initiated, long-term male members of a clan were allowed to see and handle tjuringas. After protests the auction house withdrew the tjuringa from sale. However, several wooden tjuringas were still on sale on eBay . Aboriginal artist Darryl Bellotti designed the Perth Mint's Dreaming coins, a series of 45 coins which the mint issued from January 2009 to 2011. 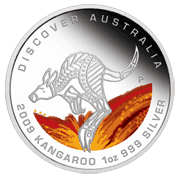 The gold, silver and platinum coins feature different interpretations of Australian animals like kangaroo, dolphin, king brown snake, brolga and echidna. It is the first time one artist has designed an entire coin series. "In ancient times boya, or money in Nyoongar culture, represented the tradeable commodities of rocks, stones of quartz and granite, and naturally occurring specimens of precious metals," explains Perth Mint Chief Executive Ed Harbuz . Detail of a shell necklace. More than 700 shells can make up a traditional length necklace which can take up to a year to create. Shell stringing, along with mutton birding (the seasonal harvesting of the chicks of petrels) and basket weaving, is one of the few Tasmanian Aboriginal traditions that has continued unbroken . 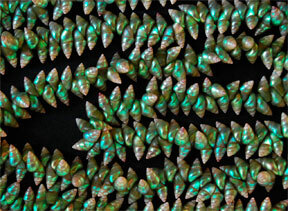 But only a handful of Aboriginal artists continue the practice of stringing tiny, brilliantly coloured maireeners and other shells. The highly-prized necklaces grace Aboriginal displays in museums around the world and come with four-figure price tags in galleries . To create a necklace from shells Aboriginal artists require intimate knowledge of shell locations and the tides. After collection the shells are prepared over six to nine months; cleaned, dried, sorted and have holes put in them—a tedious process, given their size. Then comes the stringing of up to 700 maireeners, a time-consuming process. Each shell is handled eight to nine times. One shell stringing artist is Aunty Corrie Fullard, from Hobart, Tasmania. Her necklaces are displayed in museums and private collections throughout Australia. Aboriginal artists create Pukomani poles from wooden logs. They carve and paint them with red, yellow and white ochre. Traditionally Pukomani poles were created after the death of a person and used for ceremony (dancing, singing and crying). The in-laws of the person who died commissioned and paid for them with ornaments and food, more recently with money. Pukomani poles act as headstones around the grave. A figure at the top of the pole represents the spirit who did the first ceremony.